Weekly Photo Challenge: Vivid | Oh, the Places We See . . . Vivid fabrics by Kaffe Fassett liven up a traditional quilt pattern. 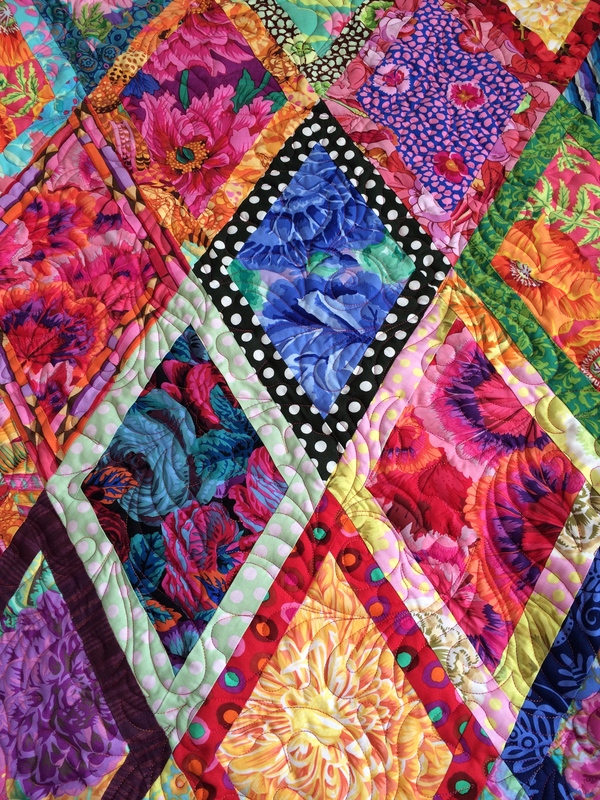 Vivid colors front and back on this quilt designed by Kaffe Fassett. 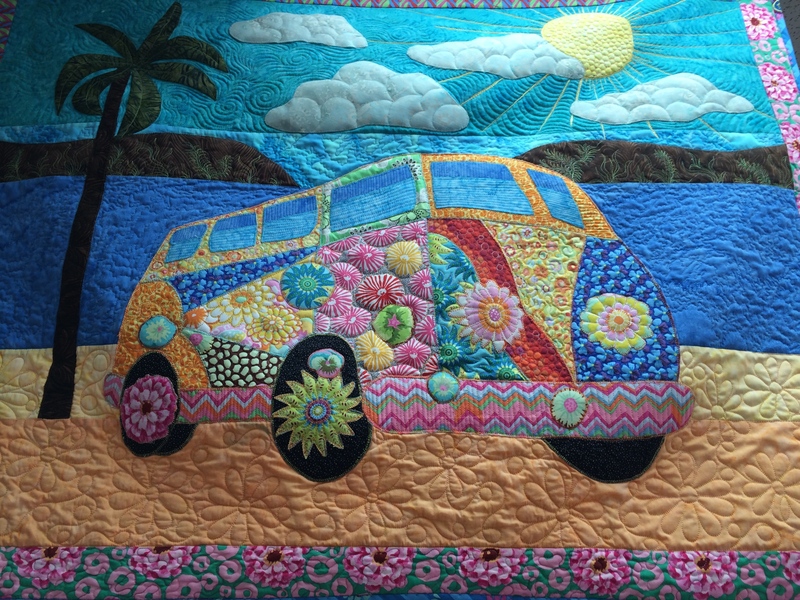 The vivid colors and contemporary patterns are the inspiration of Kaffe Fassett, a London designer who has made his mark in the design world in various textile fields: needlepoint, knitting, and now quilting. Were the 60s ever this colorful? This cute piece isn’t a Fassett design but one I couldn’t resist sharing. It’s a vivid summer somewhere! For more vivid entries in this week’s Weekly Photo Challenge, click here. All quilts shown are on display at Gina’s Bernina Sewing Center, 10816 Kingston Pike, Knoxville, TN 37934. 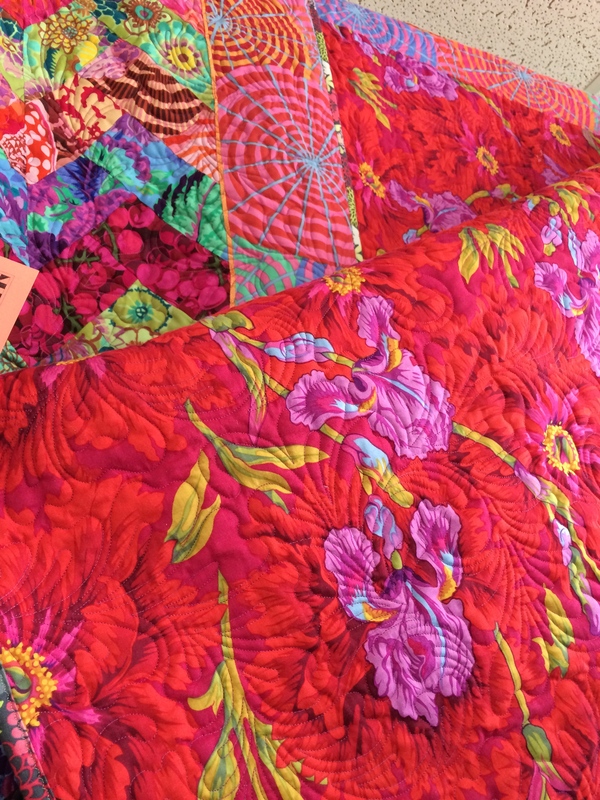 This entry was posted in Weekly Photo Challenge and tagged colorful fabrics, East Tennessee Shop Hop, Kaffe Fassett, postaday, quilting, quilts, vivid. Bookmark the permalink. Martha, you said it. May have to do a whole blog on these colorful fabrics and this designer. Best wishes for a colorful summer! Good timing for this photo challenge. There really isn’t a more vivid craft. Very nice! You’re so right about the timing. Sometime when these photo challenges come out, I’m on the lookout for something that will fit. This just happened when I was shop hopping!!! Thanks for taking a look. I love these images and they’re perfect for this week’s challenge. Thanks! We love these fabrics, too. I’m hoping to publish a blog or two about this Shop Hop, so stay tuned. The quilt shop owners outdid themselves. They really are! And thanks to you for stopping by our blog and taking a look. I guess if anything could make me want to spend time on a quilt, these fabrics could!!! These are gorgeous. I particularly like the first one. The patterns and colours work wonderfully. Thanks for commenting. I was taken by the striking colors in number 1. Yet it’s laid out in diamonds — a pattern that’s nothing special. It’s the fabric that makes it! Wow! Gorgeous fabric and quilts! I love those fabrics, too. I think they’re designed to all go together. Even in number 1, you can see that dots, flowers, stripes, etc. all look good. Thanks for taking a look. We agree! Stunning, for sure. I wonder how long it would take me to finish a quilt, if I would ever finish. I like starting projects, but it’s hard to finish! Thanks for the comment. Isn’t that bus great!!! So fun. And reminds me of when I was in college!!! Just beautiful! Perfect for this photo challenge! Thanks! It was eye-opening to see quilts in these bright colors. Thanks for commenting. Oh how wonderful! I love the second one! I love that one, too, Cindy. But there are so many. I noticed that Kaffe Fassett has written several books — would love to look through them for more inspiration!